Posted on May 22, 2018 at 5:19 am. The SOLs resume today with 8th graders on all teams taking the World Geography Exam. Here’s a look at the testing schedule for May 22nd…. 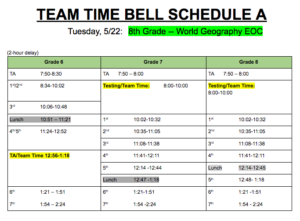 We will be following “Team Time Bell Schedule A.” While the 8th graders are testing from 8 to 10 a.m. — 7th graders will go to Team Time, and 6th graders will follow the adjusted ‘A’ schedule beginning at 8:34. Testing locations are listed on the call-board by the auditorium, or you can check with your TA teacher. Who’s ready for field hockey?? The Yorktown High School Field Hockey team will be hosting an informational meeting for interested 8th graders on WEDNESDAY at 3:15 in Patriot Hall at YHS. Participants will get to meet the coach and several players, learn about “green days’ and team camp, and get a head start on next year’s season. See Ms. Hogwood with any questions.